For generations, Coast Salish and First Nations artists developed visual language made up of colors, lines, shapes and space. These centuries-old designs can be recognized on cultural objects including basketry, carving, blankets and jewelry. 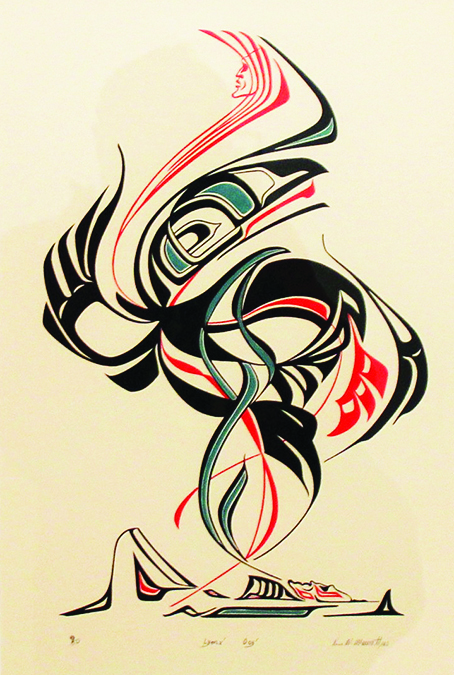 When Coast Salish artists began printmaking in the 1960s, they translated their graphic languages onto a flat surface. 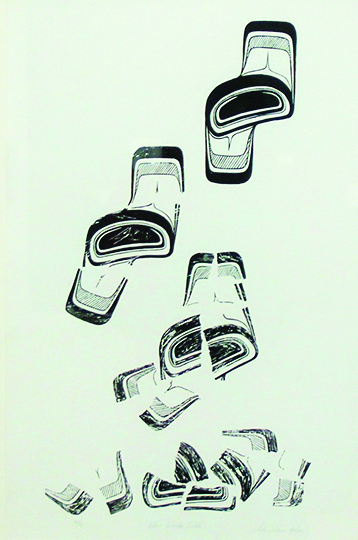 The reproducible print medium raised visibility for Indigenous arts in the Pacific Northwest and beyond. 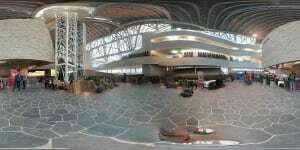 *This mother-daughter collaboration won the City of Vancouver’s “Art Underfoot” competition in 2004. The design can be found on storm sewer covers throughout the Vancouver area. The Tacoma Art Museum (TAM) is currently showcasing the vast styles of printmaking by tribal artists in its Cultural imPrint: Northwest Coast Prints exhibit. Reminding us of the local talent and cultural beauty inherent in works by artists from various First Nations and Native tribes along the Pacific Coast, you can take advantage of this special exhibition by visiting TAM now through August 20. Faith Brower, TAM’s Curator of Western American Art, has partnered with co-curator India Young from Victoria, B.C. 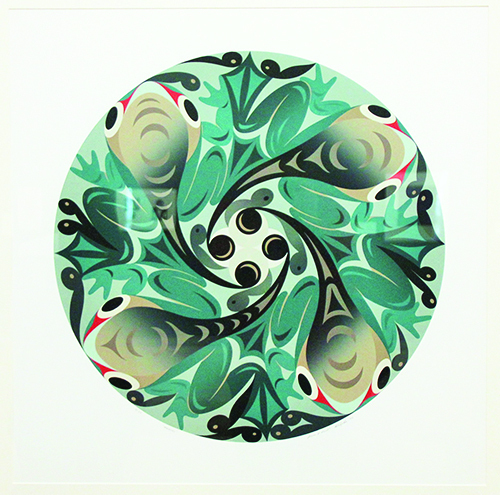 to bring together a selection of approximately 46 prints by 30 Coast Salish and Fist Nations artists. Providing a survey of Indigenous artists who have defined six-decades of printmaking in the Pacific Northwest, this exhibition proudly boasts a cultural narrative. Through their prints, these artists share knowledge about the diverse cultures in the region, while sustaining their art and history. Some of this artwork focuses on culturally specific design motifs that can identify a nation or tribe within the region. 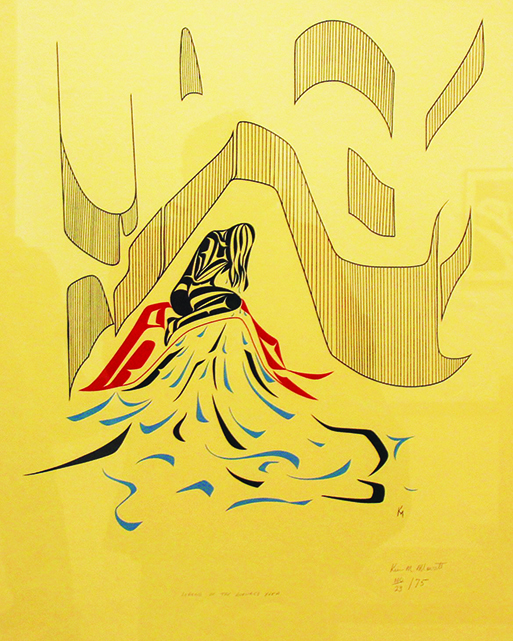 Others affirm how artists have used the print medium to reexamine the role of women’s histories with Northwest Coast communities. Still other works illuminate the passion of knowledge between generations. 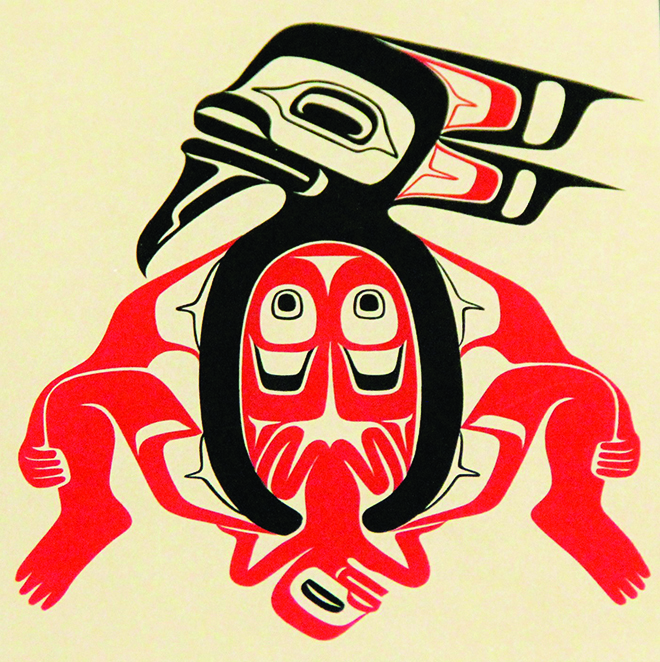 Much of the printmaking from the Northwest Coast can be immediately recognized by the high contrast, black and red graphics. Indigenous printmaking in the region continues to be exploratory and innovative while adhering to traditional teachings. 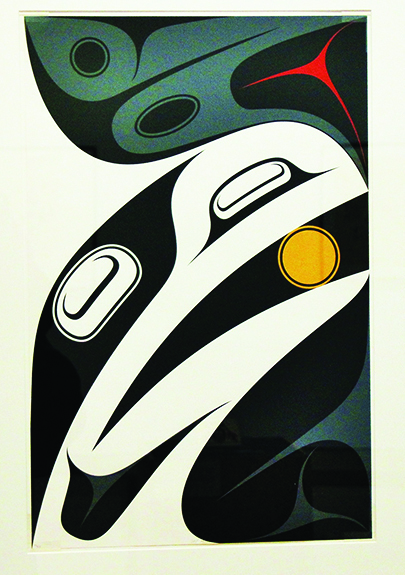 Through the print medium artists expand on their visual languages to create works that broaden the scope of Northwest Coast art. 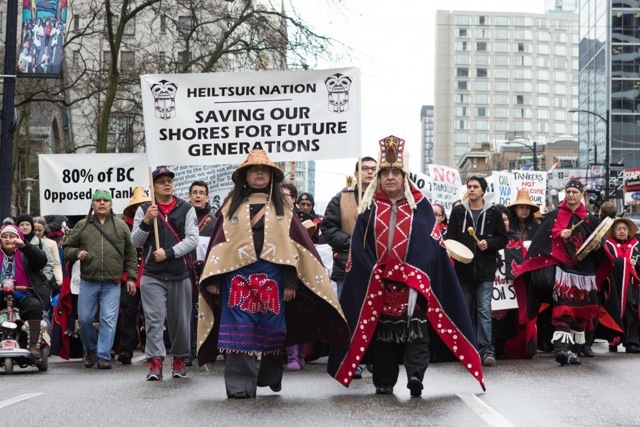 Can a First Nations-led, people-driven movement really have the power to stop Big Oil? The folks behind the Pull Together campaign think so. The Pull Together initiative supports First Nations in B.C. who are taking to the courts to stop Enbridge’s Northern Gateway project. Led by the Gitxaala, Heiltsuk, Kitasoo/Xai’xais, Nadleh Whut’en, Nak’azdli and Haida — nations united in their fierce opposition to tar sands oil endangering their traditional territories — Pull Together’s involvement synchronized with a very active movement against tar sands pipelines in B.C. and community-based opposition Enbridge in particular. The campaign is using a new model of online fundraising that, combined with real-world, grassroots organizing, is delivering solid results. It’s a model where Indigenous leadership combines with cutting-edge organizing strategies — online, on the land and on the streets. Through a unique blend of real-world events and online fundraising, Pull Together has raised an astonishing $250,000, and is looking forward to realizing a goal of $300,000 by the end of 2014. The support Housty and other First Nations leaders are enjoying has been building, with involvement by many people and groups over many years. Pull Together has tapped into a powerful anti-tankers and pipelines movement that represents the majority of British Columbians who don’t want the Enbridge project to proceed. The campaign has motivated organizers, businesses, and community groups who understand the power, and principle, of standing with First Nations opposed to oil and gas development on our west coast. From Haida Gwaii to Nelson, Kitsilano to Kitgaatla, B.C’s creative, tough, and committed culture is coming out in full force to fight Enbridge. Alliance building between NGOs — Sierra Club B.C. and RAVEN have joined forces on the campaign– offers a way forward for an environmental movement that has suffered from fragmentation in the past. Who knew stopping a pipeline could be so much fun? While the goal of stopping a pipeline is deadly serious, the means to that end are less of a struggle, and more of a celebration. With over 40 events, 100 online fundraisers and 30 businesses involved, Pull Together is lighting up B.C. The campaign got its start with a spaghetti dinner hosted by Friends of Morice-Bulkley Valley in Smithers. From that original $2,000 fundraiser, the campaign gained steam with an Island All-Stars gala on Pender Island, featuring Daniel Lapp, Mae Moore and Lester Quitzau that brought in $8,000. Salt Spring Island’s “Only Planet Cabaret” brought in $5,000 over three sold-out shows in Victoria and on the islands, while tickets to the Pull Together show at St. Barnabas in Victoria, featuring headliners Compassion Gorilla and Art Napoleon, sold fast. The campaign has inspired artists, from Kitgaatla nurse and photographer Paulina Otylia, who donated family portrait sessions for the campaign, to Franke James of “Banned on the Hill” fame who has contributed limited edition prints. At last weekends’ East Side Culture Crawl, Shannon Harvey’s Monkey 100 studio is featuring “Wish You Were Here” woodcut postcards with proceeds to Pull Together. Businesses are pulling too: Salt Spring Coffee held a “Lattes for the Coast” fundraiser this week, while the B.C. Kayak Guide Association has assembled an online fundraising team comprised of kayak guides and outfitters. Moksha Yoga B.C. have raised nearly $10,000 for the campaign by holding fundraising karma yoga classes and in-studio film screenings. Led by Eric Mathias, Moksha have extended their reach to include 25 yoga studios all across B.C. who have pledged to “Stretch Across B.C.” and fundraise for Pull Together. The fundraising initiative is rapidly spreading both online and off, as people recognize this is a strategic way to stop Enbridge — and send a powerful message to Ottawa. There’s a saying among B.C. First Nations: many paddles, one canoe. Who knew stopping a pipeline could be so much fun? 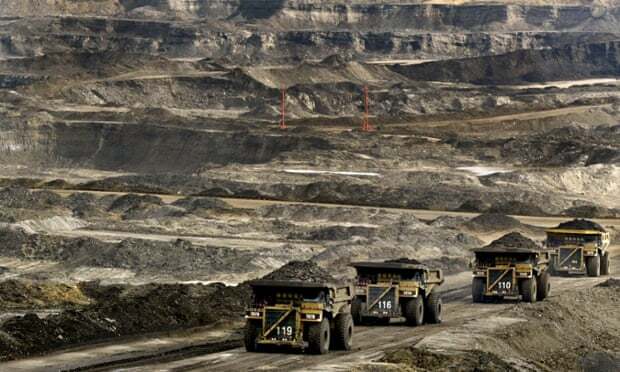 Anti-tar sands campaigns have cost the industry a staggering $17bn (£11bn) in lost revenues, and helped to push it onto the backfoot, according to a study by the Institute for Energy Economics and Financial Analysis (IEEFA), and Oil Change International. Another $13.8bn has been lost to transportation bottlenecks and the flood of cheap crude coming from shale oil fields, says the Material Risks report, which presents the first quantification of the impact that environmental campaigners have had on the unconventional energy business. The industry is currently facing a decline in increased capital expenditure on new tar sands projects, due to problems in transporting the crude, which the study links to public campaigns. While industry profits continue to fall, the report says that lack of market access helped to stymie three major tar sands enterprises in 2014 alone – Shell’s Pierre River, Total’s Joslyn North and Statoil’s Corner project – which together would have emitted 2.8bn tonnes of CO2. Protests by environmentalists have been swollen by the presence of first nations communities, angry at the environmental damage they fear the industry could wreak on their ancestral lands. Canada has staked its energy future on a massive expansion of tar sands, which hold the world’s third largest reserve of crude after Saudia Arabia and Venezuela. But the huge amounts of water and solvents needed to extract oil from bitumen dramatically boost greenhouse gas output and, on latest production forecasts, will increase Canada’s CO2 emissions by 56 megatonnes by 2020. The tar sands production process involves steam injection, strip mining and refining, and leaves environmental scars ranging from clear-cut forests to toxic tailing ponds and destroyed farmland. This has pushed the focus of environmental and indigenous land rights protests onto export pipelines, such as the stalled Keystone XL project to send tar sands crude to the US. According to the new paper, the industry’s current inability to build new pipelines has the potential to cancel most, if not all, planned new projects. It says that the 6.9bn barrels of tar sands this could still leave underground by 2030 would be the equivalent of an additional 4.1bn tonnes of CO2 emissions – or the same as 54m average passenger vehicles, over the same period. These First Nations have been emboldened by this summer’s Supreme Court of Canada William decision, which recognized the aboriginal title of the Tsilhqot’in nation to 1,750 sq km of their land in central British Columbia – not outright ownership, but the right to use and manage the land and to reap its economic benefits. The ruling affects all “unceded” territory in Canada – those lands never signed away through a treaty or conquered by war. Which means that over an enormous land mass – most of British Columbia, large parts of Quebec and Atlantic Canada, and a number of other spots – a new legal landscape is emerging that offers the prospect of much more responsible land stewardship. 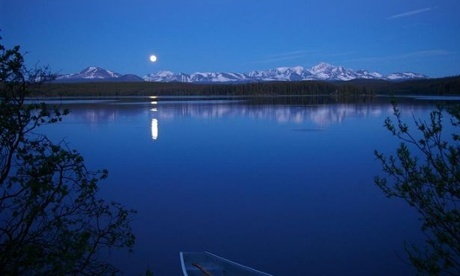 First Nations are starting to act accordingly, and none more so than the Tsilhqot’in. They’ve declared a tribal park over a swath of their territory. And they’ve announced their own policy on mining – a vision that leaves room for its possibility, but on much more strict environmental terms. Earlier this month they erected a totem pole to overlook a sacred area where copper and gold miner Taseko has for years been controversially attempting to establish itself; no mine will ever be built there. And the Canadian government’s response? Far from embracing these newly recognised indigenous land rights, they are trying to accelerate their elimination. The court has definitively told Canada to accept the reality of aboriginal title: the government is doing everything in its power to deny it. Canadians can be pardoned for believing that when the country’s highest court renders a decision, the government clicks their heels and sets themselves to implementing it. The judiciary directs, the executive branch follows: that’s how we’re taught it works. But it doesn’t always – and especially not when what’s at stake is the land at the heart of Canada’s resource extraction. The new land rights ruling is now clashing directly with the Canadian government’s method for cementing their grip on land and resources. It’s a negotiating policy whose name – the so-called Comprehensive Land Claims – is intended to make your eyes glaze over. But its bureaucratic clothing disguises the government’s naked ambition: to grab as much of indigenous peoples’ land as possible. This is what dispossession by negotiation looks like. The government demands that First Nations trade away – or in the original term, to “extinguish” – their rights to 95% of their traditional territory. Their return is some money and small parcels of land, but insidiously, as private property, instead of in the collective way that indigenous peoples have long held and stewarded it. And First Nations need to provide costly, exhaustive proof of their rights to their own land, for which they have amassed a stunning $700 million in debt – a debt the government doesn’t think twice about using to arm-twist. Despite the pressure, most First Nations have not yet signed their names to these crooked deals – especially when the supreme court is simultaneously directing the government to reconcile with First Nations and share the land. But the supreme court’s confirmation that this approach is unconstitutional and illegal matters little to the government. What enables them to flout their own legal system is that Canadians remain scarcely aware of it. Acting without public scrutiny, prime minister Stephen Harper is trying to shore up support for this policy – now 40 years old – to finally secure the elimination of indigenous land rights. The process is led by the same man, Douglas Eyford, who has been Harper’s advisor on getting tar sands pipelines and energy projects built in western Canada. That is no coincidence. The government is growing more desperate to remove the biggest obstacle that stands in the way of a corporate bonanza for dirty fossil fuels: the unceded aboriginal title of First Nations – backed now by the supreme court of Canada. A public commenting period opened during the government’s pr blitz has created an opportunity for the indigenous rights movement and concerned Canadians to demand a long-overdue change in the government’s behaviour. Recognising aboriginal title, restoring lands to First Nations management, would be to embrace the diversity and vision we desperately need in this moment of ecological and economic crisis. Because the government agenda is not just about extinguishing indigenous land rights. It’s about extinguishing another way of seeing the world. About extinguishing economic models that prize interdependence with the living world, that recognise prosperity isn’t secured by the endless depletion of resources. And about extinguishing a love for the land, a love rooted in the unique boundaries and beauty of a place. The few days I spent in Tsilhqot’in territory five years ago made that vivid. It is a land of snow-capped mountains – Ts’il-os, who in their stories was a man transformed into giant rock after separating from his wife. Wild horses stalk the valleys. Salmon smoke on drying racks. The Tsilhqot’in carefully protect and nurture these fish – running stronger in their rivers than anywhere else in the province. That’s why the habit of government officials, of media and even of supreme court judges to call the Tsilhqoti’in “nomadic” bothers William so much: his people have lived on these lands for thousands of years, while it is non-natives who are constantly moving and resettling. And what could be more nomadic and transient than the extractive industry itself – grabbing what resources and profits it can before abandoning one area for another. As Canadians look more closely, they are discovering that the unceded status of vast territories across this country is not a threat, as they’ve long been told. It is a tremendous gift, protected with love by indigenous nations over generations, to be seized for the possibilities it now offers for governing the land in a radically more just and sustainable way for everyone. In this battle between the love of the land and a drive for its destruction, those behind the extractive economy have everything to lose and indigenous peoples everything to win. The rest of us, depending on our stand, have a transformed country to gain. Tribes from US, Canada sign bison treaty. BILLINGS, Mont. (AP) — Native tribes from the U.S. and Canada signed a treaty Tuesday establishing an inter-tribal alliance to restore bison to areas of the Rocky Mountains and Great Plains where millions of the animals once roamed. Leaders of 11 tribes from Montana and Alberta signed the pact during a daylong ceremony on Montana’s Blackfeet Reservation, organizers said. It marks the first treaty among the tribes and First Nations since a series of agreements governing hunting rights in the 1800s. That was when their ancestors still roamed the border region hunting bison, also called buffalo. The long-term aim of Tuesday’s “Buffalo Treaty” is to allow the free flow of the animals across the international border and restore the bison’s central role in the food, spirituality and economies of many American Indian tribes and First Nations — a Canadian synonym for native tribes. Such a sweeping vision could take many years to realize, particularly in the face of potential opposition from the livestock industry. But supporters said they hope to begin immediately restoring a cultural tie with bison largely severed when the species was driven to near-extinction in the late 19th century. “The idea is, hey, if you see buffalo in your everyday life, a whole bunch of things will come back to you,” said Leroy Little Bear, a member of southern Alberta Blood Tribe who helped lead the signing ceremony. “Hunting practices, ceremonies, songs — those things revolved around the buffalo. Sacred societies used the buffalo as a totem. All of these things are going to be revised, revitalized, renewed with the presence of buffalo,” said Little Bear, a professor emeritus of Native American studies at the University of Lethbridge. Bison numbered in the tens of millions across North America before the West was settled. By the 1880s, unchecked commercial hunting to feed the bison hide market reduced the population to about 325 animals in the U.S. and fewer than 1,000 in Canada, according to wildlife officials and bison trade groups in Canada. Around the same time, tribes were relocated to reservations and forced to end their nomadic traditions. There are about 20,000 wild bison in North America today. Ranchers and landowners near two Montana reservations over the past several years fought unsuccessfully against the relocation of dozens of Yellowstone National Park bison due to concerns about disease and bison competing with cattle for grass. The tribes involved — the Assiniboine and Sioux Tribes of the Fort Peck Reservation and the Assiniboine and Gros Ventre Tribes of the Fort Belknap Reservations — were among those signing Tuesday’s treaty. Keith Aune, a bison expert with the Wildlife Conservation Society, said the agreement has parallels with the 1855 Lame Bull Treaty, a peace deal brokered by the U.S. government that established hunting rights tribes. The treaty signatories collectively control more than 6 million acres of prairie habitat in the U.S. and Canada, an area roughly the size of Vermont, according to Aune’s group. Among the first sites eyed for bison reintroduction is along the Rocky Mountain Front, which includes Montana’s Blackfeet Reservation bordering Glacier National Park and several smaller First Nation reserves. One year after the Reconciliation Walk brought 70,0000 people into the streets of Vancouver to walk with First Nations, another epic march took place. With a contingent of indigenous women from Canada and around the world leading the way, Sunday’s 400,000-strong People’s Climate March in New York City shone a spotlight on a different kind of indigenous leadership. The sheer numbers and diversity of those marching alongside aboriginal people— together with countless others who took part in marches around the globe—was a powerful symbol of the shift towards climate justice within the environmental movement. Some of the most popular images from the New York City march came from the indigenous block, where Leonardo DiCaprio, Edward Norton, and Mark Ruffalo walked, brandishing a “Shut Down the Tar Sands” banner. 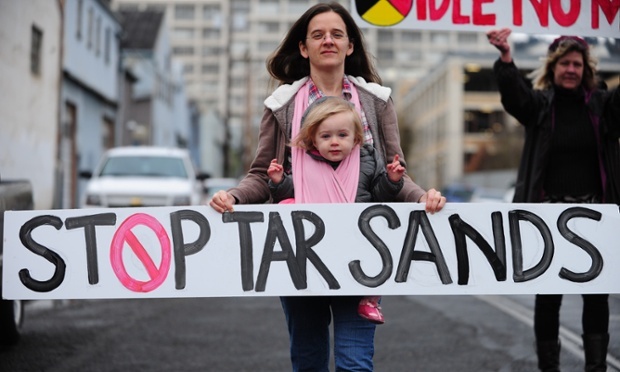 They want people to get the message that tarsands expansion— and pipelines across B.C. —will bring climate devastation to vulnerable communities the world over. At home in B.C., stopping the expansion of the tarsands means the Northern Gateway must never be built. Standing together with the First Nations along the pipeline and tanker routes is crucial to realizing that goal. The passion of thousands of British Columbians who have marched and signed pledges to stop the Northern Gateway is being channelled into a new initiative, Pull Together, launched this month. “I came to New York to talk about the disproportionate vulnerabilities frontline communities face with relation to climate change,” says Melissa Daniels, a lawyer with Woodward & Company LLP and member of the Athabasca Chipewyan First Nation. She should know: her hometown is Fort Chipewyan, in the epicentre of the tarsands. Throughout her people’s traditional territory, fossil fuel projects are expanding at breakneck speed. The cumulative impacts of oil, gas, and coal projects—from extraction to transportation to climate change—are overwhelming. The Pull Together approach aims to change that paradigm. Indigenous leaders from across the north have invited help from all corners of B.C. to keep Enbridge out of their traditional territories. The campaign offers a chance to stand and be counted in one of the most important fights of our time. Though they have invited help from the wider community, the message indigenous leaders are bringing is one of empowerment. Says Lee, who spoke at the opening plenary of the Climate Convergence, “There are so many people in our communities who are fighting these battles on the ground every single day. Connecting with other indigenous people from all over the world really strengthens my resolve in working on those issues. ” The solidarity being fostered—with the covergence of indigenous peoples and allies in initiatives like Pull Together— offers a way forward. Susan Smitten, executive director of RAVEN (Respecting Aboriginal Values and Environmental Needs), believes that First Nations constitutional rights are the strongest tool there is to fight run-away climate change in B.C. “With the dismantling of so much environmental legislation in Canada, the last —and hopefully inviolable— line of defence is First Nations’ Treaty and Constitutional rights,” says Smitten. RAVEN are also in New York this week, to attend an international conference aimed at increasing indigenous philanthropy. One goal is to drum up support for a new campaign, Pull Together, that aims to raise $250,000 for five First Nations in B.C. who are taking legal action to stop the Northern Gateway pipeline project. This new campaign invites the majority in BC who oppose Enbridge to unleash their potential and find fun, empowering ways to raise funds. Just weeks into the campaign, Moksha Yoga has pledged to raise $10,000 through their studios across B.C., while communities from Smithers to Salt Spring have pulled together to raise $25,000. Thanks to the millions of people who marched worldwide, and to the leadership shown by front lines aboriginal activists this weekend, the climate justice movement has gone viral. Grounding that energy are the commitments that spring from this historic convergence. 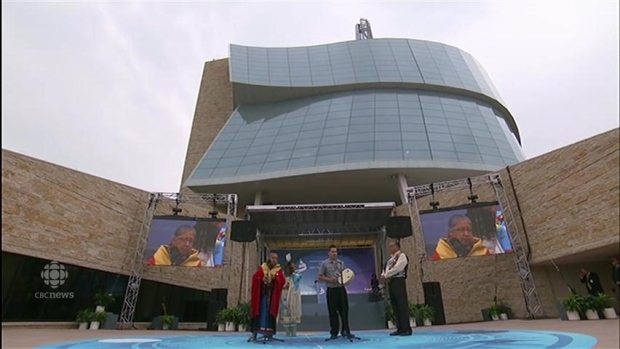 It was a morning of music, dance, speeches, a little rain and a lot of protest as the Canadian Museum for Human Rights officially opened in Winnipeg. “With the placement of this final stone, at the heart of our circle, it is with great pleasure that we now declare open the Canadian Museum for Human Rights,” Gov. Gen. David Johnston stated as the centre stone — part of a circle of hand-gathered stones from national parks and national historic sites — was set in place during the opening ceremony Friday. Inside the event, hundreds of dignitaries gathered and heard speeches about the genesis and purpose of the $351-million museum. Meanwhile outside, dozens of protesters used the media spotlight to bring attention to issues of murdered and missing women, First Nations water rights, the disappearing traditional lifestyle of First Nations and the Palestinian conflict. “What happens when these guys over here, with their suits and ties and their outfits, destroy everything?” one First Nations protester yelled. One of the first groups to arrive brought their message of the struggle of Palestinian people in Gaza. They said they feel overlooked and will continue to push in the hopes that eventually they will be featured in the museum. The protesters said they were upset the issue is not being recognized at the museum, even though they have met with museum representatives over the past couple of years to have it featured in one of the galleries. Other protesters called on the museum to recognize what they said was the historical “genocide” committed against First Nations by the Canadian government. They drummed, performed ceremonial smudges, chanted and carried placards. 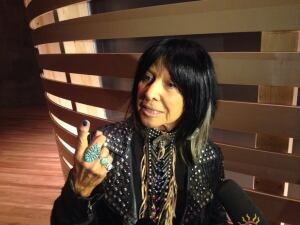 Their sentiments were echoed by legendary Canadian musician Buffy Sainte-Marie, who is performing at the museum’s opening concert Saturday night. Sainte-Marie told reporters that Canada and the human rights museum should use the term “genocide” to describe the residential school experience. “I think the museum needs to be much more honest, much more bold and much better informed,” she told reporters Friday afternoon. Sainte-Marie admitted that she hadn’t seen all the galleries in the museum yet, but added that her expectations were not high. Saturday’s concert was supposed to feature First Nations DJ group A Tribe Called Red, but the group pulled out on Thursday, citing concerns about how the museum portrays aboriginal issues. “We feel it was necessary to cancel our performance because of the museum’s misrepresentation and downplay of the genocide that was experienced by indigenous people in Canada by refusing to name it genocide,” the group said in a statement Friday. Museum president and CEO Stuart Murray said the museum will and should spark protest and debate. The vision for the museum has always been to allow people to voice their opinions, he said. “The Canadian Museum for Human Rights will open doors for conversations we haven’t had before. Not all of these conversations will be easy. 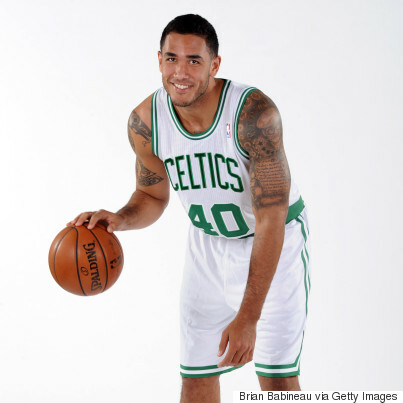 We accept that but we will not shy away,” he said. Officials said they are open to talking to different groups and will update the museum’s content as human rights issues unfold around the world. In addition to the opposition from protesters, the museum has faced construction delays leading up to Friday morning’s grand opening ceremony, which began with an indigenous blessing led by elders, including a First Nations prayer, a Métis prayer and the lighting of an Inuit qulliq, or oil lamp. ​The ceremony was attended by numerous dignitaries including the Governor General and former Manitoba premier Gary Doer, who is now Canada’s ambassador to the United States. Current Manitoba Premier Greg Selinger, Winnipeg Mayor Sam Katz and the museum’s national campaign chair, Gail Asper, spoke at the event, while the program also featured special performances from Canadian vocal quartet the Tenors, YouTube singing star Maria Aragon and Winnipeg singer-songwriter and fiddle player Sierra Noble. Asper paid tribute to her late parents, Babs and Israel Asper, who were the driving forces behind the museum. “Neither my father Israel nor my mother Babs [is] here alive to celebrate with us, but I know they would be filled with gratitude and joy that the journey is finally beginning, this beautiful journey of education and, most importantly, action,” Asper said during the ceremony. A children’s dance finale, representing Canada’s next generation of human rights leaders, concluded the opening ceremonies program. Prime Minister Stephen Harper wasn’t in attendance. A spokesperson said his schedule did not permit him to be there. Heritage Minister Shelly Glover, who attended the opening ceremony, said the museum is an important space. “This is a museum that will provide information and an educational opportunity to so many Canadians, and it’ll make you proud to be a Canadian,” she said. When asked about the protesters outside, Glover said she would like people to take a look at the museum before judging what’s inside. The country’s new national museum is located next to the Forks National Historic Site, where the Red and the Assiniboine rivers meet in downtown Winnipeg. Designed by world-renowned architect Antoine Predock, the museum with its Tower of Hope and sweeping windows forms a new silhouette on the city’s skyline. The museum has been a lightning rod for protests, and some academics say they’re concerned the content may be susceptible to interference by governments, donors and special interest groups. “The most important concern is not the concern of individual communities who are disputing the exact manner in which their wrongs have been depicted, but rather the overall issue of independence,” said Michael Marrus, an expert on international human rights at the University of Toronto. Murray said the museum has not been subject to any interference, and the content does expose Canada’s human rights failures. “You have to shine a light in some dark corners in Canada’s history because we have to know, I think, where we came from to know where we’re going,” he said. Northwest Tribes and First Nations block fossil fuel exports. Across the Northwest, Native communities are refusing to stand idle in the face of unprecedented schemes to move coal, oil, and gas through the region. It’s a movement that could well have consequences for global energy markets, and even the pace of climate change. Now is a good moment for pausing to examine some of the seminal moments of resistance from tribal opposition to fossil fuel exports. Yesterday, the second Totem Pole Journey came to an end with a totem pole raising ceremony at the Beaver Lake Cree Nation in Alberta. As it did last year, the journey showcased the tremendous breadth and depth of indigenous opposition to coal and oil schemes—spanning Native communities from coastal forests to the high plains interior of North America. The journey was a reminder not only of the particular moral authority of the tribes and First Nations in the face of fossil plans, but also the fact that they are uniquely equipped to arrest these export plans. Like the United States, Canada is in the midst of a natural gas boom. The industry is trying desperately to move its products to foreign markets, but concerns about public health, fishing rights, and environmental damage have First Nations raising red flags. My elders said, you treat people kind, you treat people with respect… even when they are stabbing you in the back. So I respectfully ask government to please remove yourselves from the room. Gale later asked LNG representatives to leave as well, and the event galvanized the BC aboriginal community. Since then, no fewer than 28 BC First Nation organizations have signed a declaration to put the facility on hold. Elsewhere in the province, aboriginal communities have been in a long standoff with proponents of the highly controversial Enbridge Northern Gateway Pipeline, a proposal that would move tar sands oil from Alberta to port facilities in BC where it would be transferred to tankers that would move the crude to Pacific markets. At least 50 First Nation leaders and 130 organizations have signed the “Save the Fraser Declaration.” Citing concerns over water quality, fishing, treaty rights, and sovereignty, nine coastal First Nations even went so far as to preemptively ban oil tankers in their territorial waters. 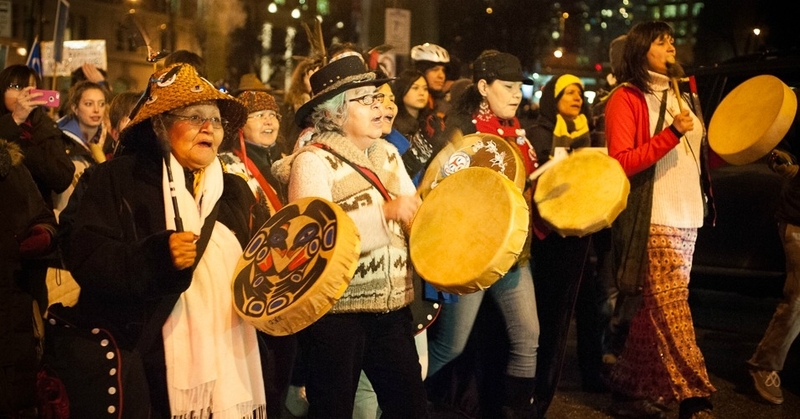 The Canadian federal government gave approval to the Northern Gateway Pipeline in June, and women of the Gitga’at Nation did not take it lying down. In protest, they stretched a 4.5 kilometer (2.7 mile) crochet chain across the narrow channel near Kitimat, where the export facility is proposed to be built. “It’s to show that we’re prepared to do what it takes to stop them because we can’t let it happen. It’s the death of our community, our culture,” said Lynne Hill, who generated the idea. Now, similar opposition is mounting against Kinder Morgan’s planned Trans Mountain Pipeline expansion in southern BC, and BC First Nations are challenging it in court. You cannot eat money…you see the devastation of the oil sands: a huge part of that land is no good. What’s going to happen to us? What’s going to happen to our children? Like their neighbors to the north, Washington Tribes have had major concerns over fossil fuel exports, not to mention the way they have been treated by proponents of the projects. In 2011, the would-be builder of the Gateway Pacific coal terminal near Bellingham got into hot water with permitting agencies after it was discovered that they had begun construction without approval. Not only did construction crews destroy acres of sensitive wetlands, they also damaged local Lummi Nation burial grounds. It was a not-so-subtle “accident” and was the last straw for many in the local tribal community. The Lummi subsequently burned a mock check from the terminal proponents at the site of the planned coal terminal. It was a pivotal moment for activism in the Northwest. Opposition from the tribes can be a tremendous barrier for the coal, oil, and gas industries to surmount. Above and beyond their sovereignty, most of the Northwest tribes have specific fishing rights guaranteed to them in their treaties with the US government, rights that were subsequently reaffirmed and clarified by the Boldt Decision of 1974. Those tribes have firm legal footing for demanding access to their “usual and accustomed” fishing grounds, which include most of the places where fuel terminals would be located. 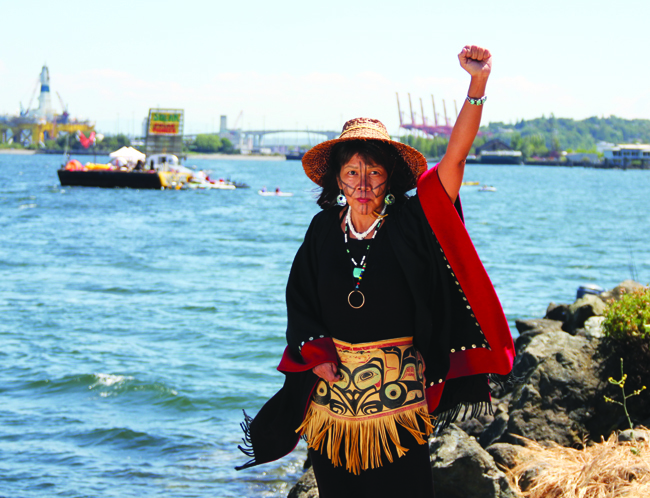 Other Puget Sound tribes have also made it publicly clear that they are firmly against coal exports. In April of last year, tribal leaders joined then-Seattle Mayor Mike McGinn in the Leadership Alliance, a coalition against coal export. When it comes to coal… the negative potential of what it does to our Northwest—we stand with you to say no to coal. As a matter of fact, the Tulalip say ‘hell no’ to coal. For thousands of years, Washington State tribes have fought to protect all that is important for those who call this great state home. We as leaders need to protect our treaty resources, our economies, and the human health of our citizens and neighbors. The few jobs that the transport and export of coal and oil offer would come at the cost of catastrophic damage to our environment for years. Everyone knows that oil and water don’t mix, and neither do oil and fish, oil and wildlife, or oil and just about everything else. It’s not a matter of whether spills will happen, it’s a matter of when. East of the Cascades, too, Native opposition has been fierce. The Yakama Tribe came out publicly and powerfully against Ambre’s proposed coal export facility in eastern Oregon, once again citing tribal fishing rights. Yakama protests and tenacity, in conjunction with other regional tribes like the Warm Spring and the Nez Perce, were a major factor in the proposal not being permitted. In Oregon, the Confederated Tribes of the Umatilla Indian Reservation also joined the Yakama in opposition to coal on the Columbia River, batting down ham-fisted attempts by the industry to buy tribal support. Networks of tribes, like the Columbia River Intertribal Fish Commission (CRITFC), also voiced their strong concerns about what the proposals would be mean for their communities. The Northwest Indian Fisheries Commission also declared its strong opposition to oil exports from the proposed site at Grays Harbor, highlighting fishing disruption in the Puget Sound, health problems in their communities, and pollution. In fact, the 57 nations that make up the Affiliated Tribes of Northwest Indians unanimously voted in May of 2013 to officially oppose all fossil fuel export facilities in the Northwest. Our communities are wedged between the railroad and the river. We’ve got nowhere to escape. If we cannot escape, neither will the coal. Lumley’s words are proving prescient. Last month, yet another Northwest coal export terminal was dealt what was likely a fatal blow. The Oregon Department of State Lands denied a crucial permit to Ambre Energy, which plans to ship coal from a site on the Columbia River. Among the most influential factors the state agency cited for its decision: tribal sovereignty. The decision was, in some ways, recognition of the power that the region’s tribes and First Nations can exercise over the fossil fuel infrastructure projects that are cropping up across the Northwest. By asserting treaty rights and voicing cultural concerns, tribes are presenting a major barrier—are a key part of the thin green line—to a reckless expansion of coal, oil, and gas schemes. Find this article interesting? Please consider making a gift to support our work.